The popularity among mobile gaming is growing strongly month by month and its expected that 2013 will be a massive year for the mobile gaming operators. This development has led to that many of the larger poker companies has done their outmost to respond to the growing demand and just for a few months ago PokerStars was actually the first and only that was fully functional on a Android phone. 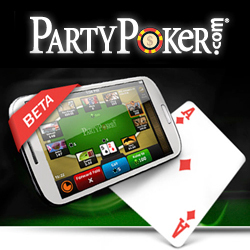 Now PartyPoker has announced their launch last Wednesday of their very own Android Poker App in a Beta Version. The app offers a single table experience for the poker player for for real money as well as for play money. At this first version it is only Holdem cash games that are available, so you will not be able to play tournaments or SNG´s nor any other forms of poker such as Omaha. To make deposits and withdrawals from the poker room, you will still need to log-in to your account on a laptop todo such transactions hence that this feature is not available in this first version. Since the merger with Bwin, the new bran Bwin.Party has grown massively and the new gaming giant is now making some large efforts to take more and more market shares.